Handwriting Without Tears was a great addition to my first graders curriculum. We are using the First Grade Books with her, this included the teachers guide and the printing book. The My Printing Book is $8.25 and the 1st Grade Teachers Book is $9.25. Well worth the minimal price if you have a child that needs some practice. There is no need to buy anything extra unless you want to purchase the chalkboard from their site. We already had one that we used while working on this book. The books are sold as first grade but they are for any kid that knows their letters but is still unable to form them well. They also have K-4 books. This was the first time that I have ever gotten a teachers manual for any of the curriculum that I have used. I was unsure what to expect from it and if it would even really help me. I was very surprised to see that it had a ton of great helpful information. Not only did it give me alternatives to showing my daughter how to do the work book but it also gave extra activities to do with her to get her to grasp the concepts that were given. 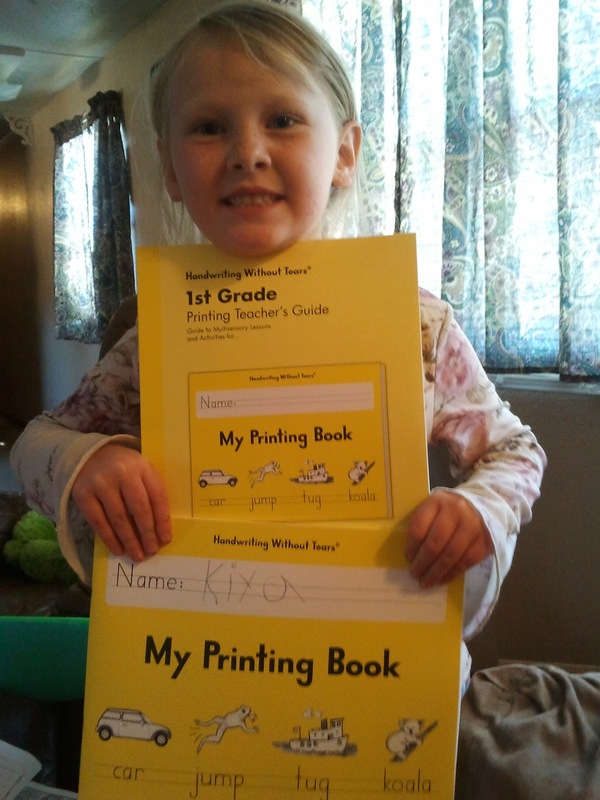 The "My Printing Book is very easy to follow. It breaks all the different types of letters down into how they are wrote. We enjoyed this because it was much better than the old fashioned writing A-Z in order over and over. We work on handwriting daily because my 6 year old that is using this still has issues with writing backwards and mixing her capitals and lowercase letters in a word. It was pretty simple to spend about 30 minutes a day reviewing the set of letters and doing the activities. One is writing the letter on a chalk board with a wet sponge then drying it and then write it for real. This gives a variate to the writing as well. My daughter enjoyed the jump letters the best as she thought it was funny they were called that and she kept saying "watch my frog jump". So our daily use of this consisted on the set of letters we currently had and writing them on the chalkboard in various orders. We would then go to our book and practice them in the book once she felt comfortable with writing the letters. The teachers guide was very easy to use which made following her book very easy to use. My wonderful little sunshine is the type that cry's with her work. We do believe that she maybe dyslexic and that is where her frustration comes with writing and the reason she hates to do it. I was very nervous about trying HWT for the fact that I thought it would be a waste and so cliche to say that she wouldn't cry. Well low and behold she actually enjoyed it. I think doing the hands on first with the chalkboard made it a game so then when we went to the book work she already was doing good with the the set of letters and was able to write them with ease in the book. Positives about HWT: Very easy to follow and the sets of letters help make it more interesting to follow and not be so plain like if we just kept writing the alphabet in order. They also had cute little sayings for how to write the word. Negatives about HWT: The only bad thing I can really say is that the books were not bold and colorful making anything pop out at you. They did have nice little pictures but all in black and white. Though this really didn't seem to phase my little beauty while she was using it. Fellow Crew Member stopping by! Glad your sweet girl enjoyed the curriculum! My son did the 1st Grade set as well and enjoyed it, too!